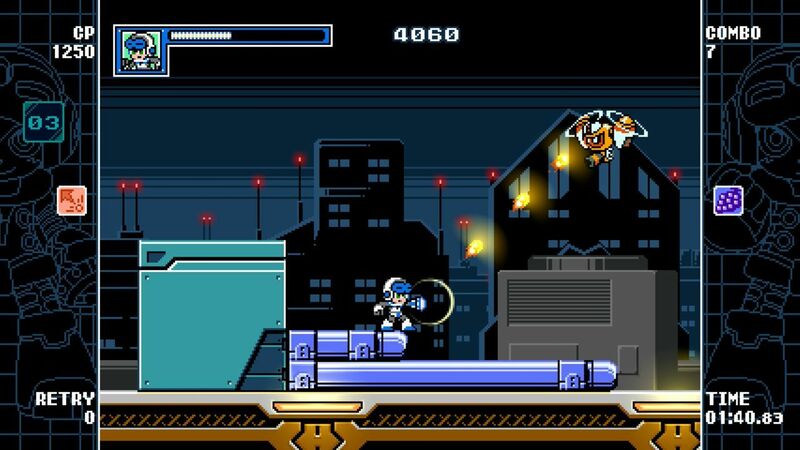 Mighty Gunvolt Burst is one of the games that was showcased in the special episode of NyaNyaNya! Neko Mario Time dedicated to “Nyandies”, yesterday. And today, at A 5th of BitSummit, Inti Creates properly revealed the game, and shared plenty of details alongside a trailer! 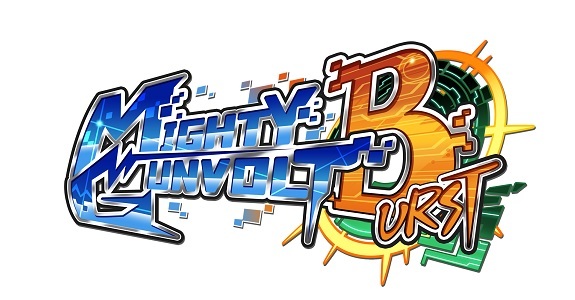 The “Burst” in the title might make you think this is just an enhanced port of Mighty Gunvolt, that was released alongside Azure Striker Gunvolt, but it’s not the case. 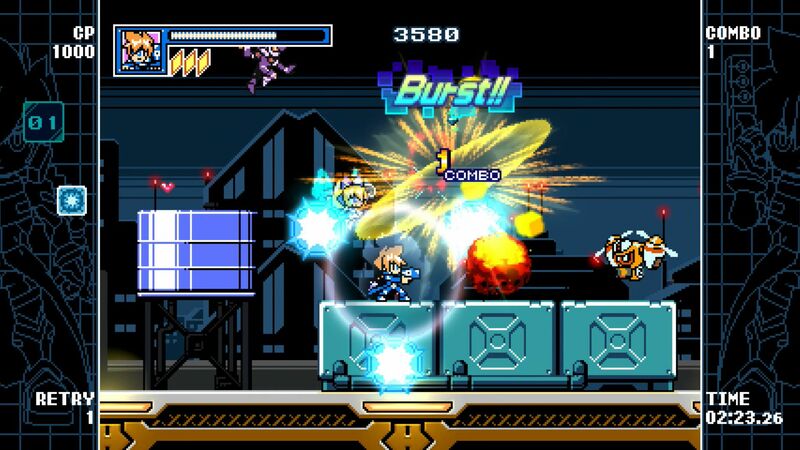 Mighty Gunvolt Burst is pretty much a brand new sequel! 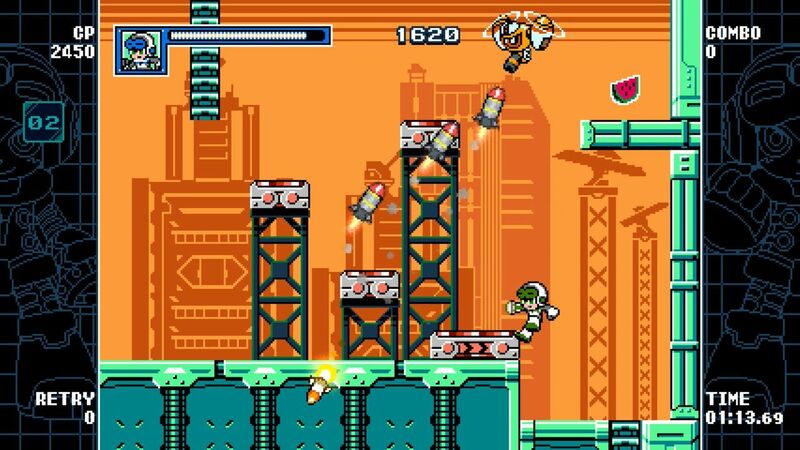 For this sequel, the developers went and completely revamped and powered up the game systems, adding lots of new additions too. 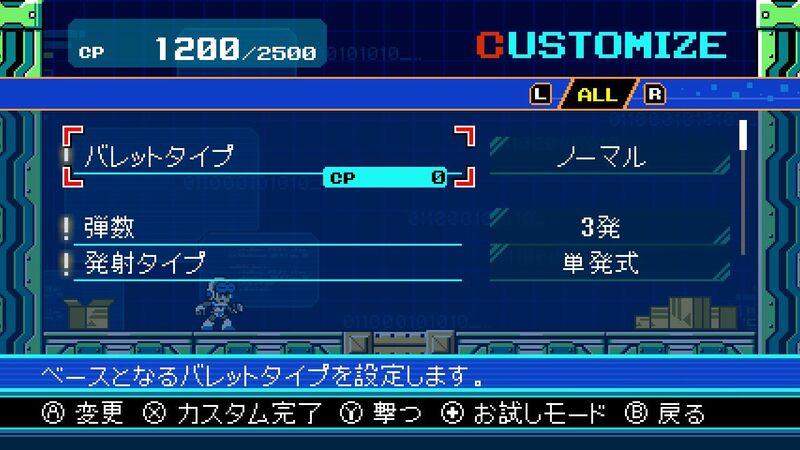 One of the new elements is a deep character customisation system. 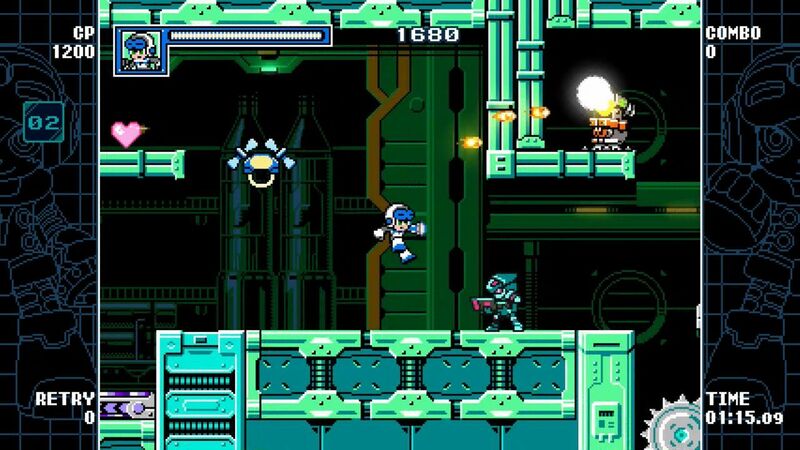 Graphics-wise, the pixel style graphics have also been redone, and now blur the line between 8-bit and 16-bit. 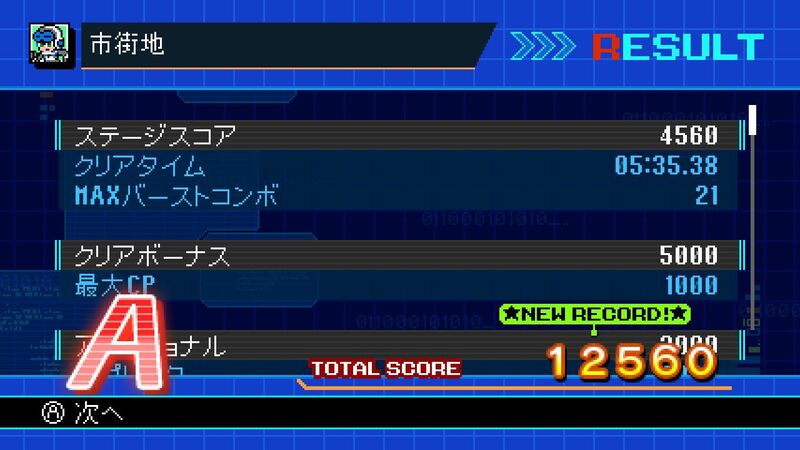 One thing that hasn’t changed: Gunvolt (from Azure Striker Gunvolt 2 this time) and Beck from Mighty No. 9 return as playable characters. 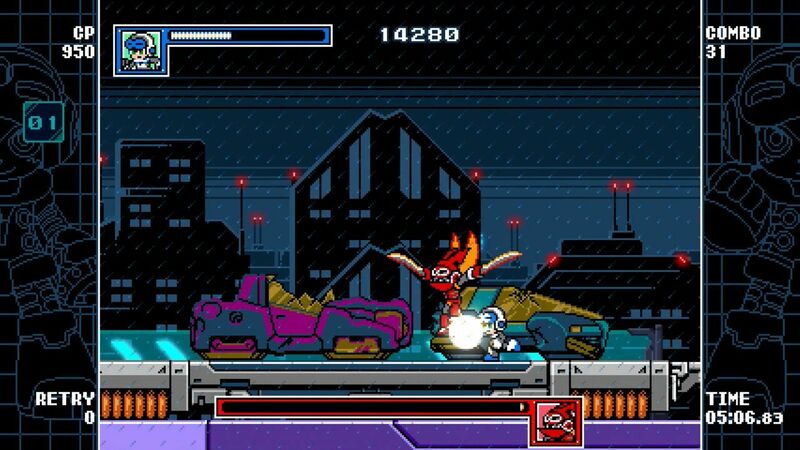 Burst: when comes the time to finish off an enemy, try to get up close and trigger a Burst. That way, enemies will explode in a more “glorious way”, which isn’t just for show: you also earn extra points! 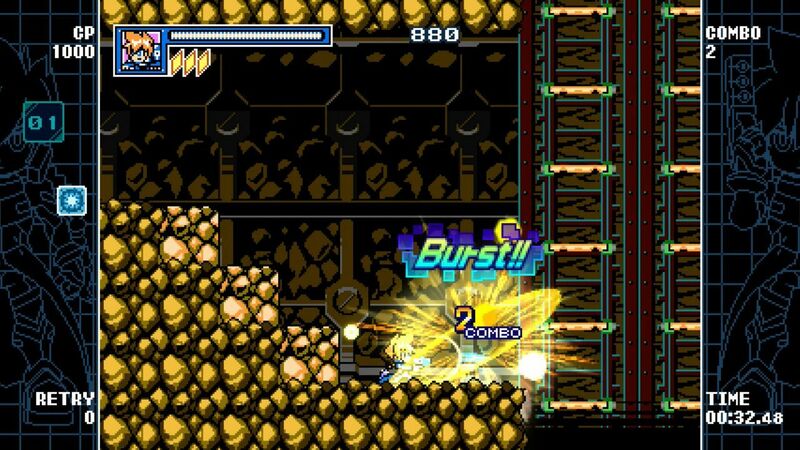 And if you chain together Bursts to create to a Burst Combos, you will rack up points even faster. 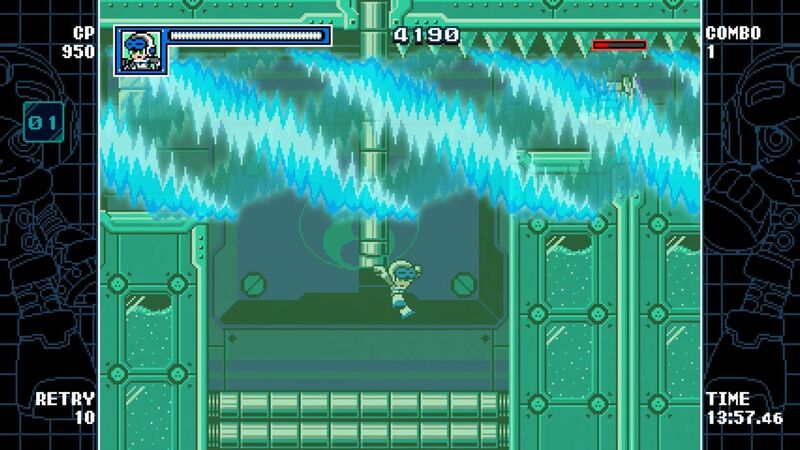 Oh, and in case you’re wondering: yes, bosses can also be defeated with a Burst! Customisation System: by collecting various modules, you can add new items to your customisation loadout. If you’re looking to increase your abilities, you will Cost Points (CP): those determine the setups available to you, since your loadout cannot exceed the amount of CP available to you. The good thing is, you’re free to change your loadout at any time! 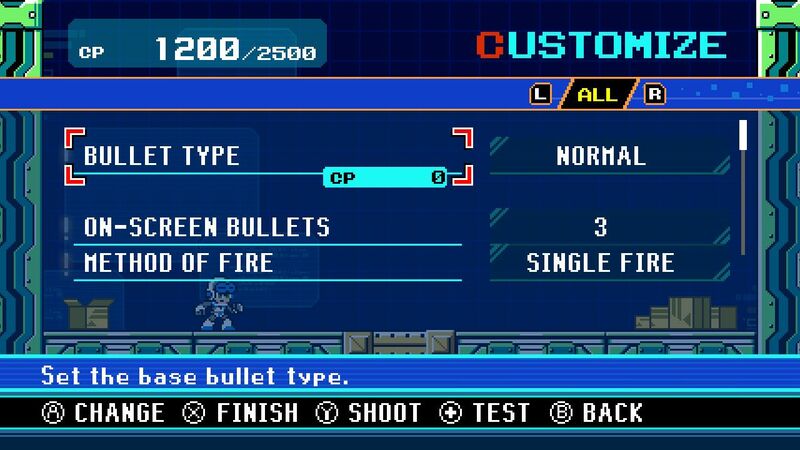 The game offers a wide variety of shot customisation options (piercing bullets, homing shots, and more), and you’re free to test your changes on the Customisation screen. Pixel Stickers: those feature 8-bit versions of characters (and others things). 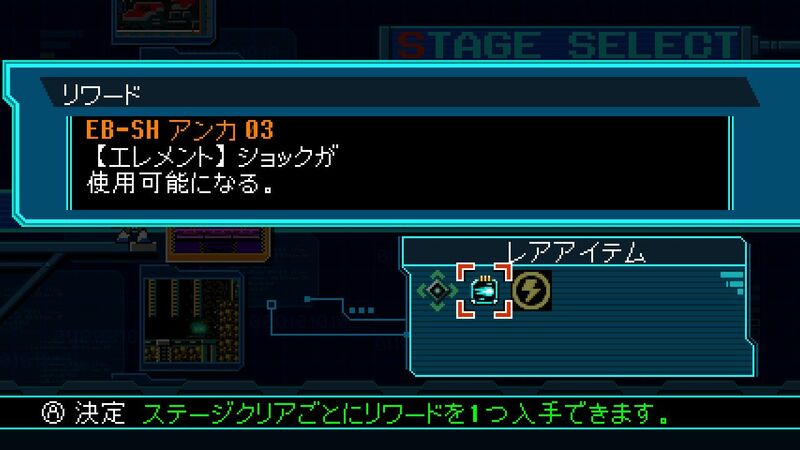 They are scattered throughout the game, and there’s various ways to obtain them: discovering them in the stages themselves, by defeating enemies (rare drops), and more. 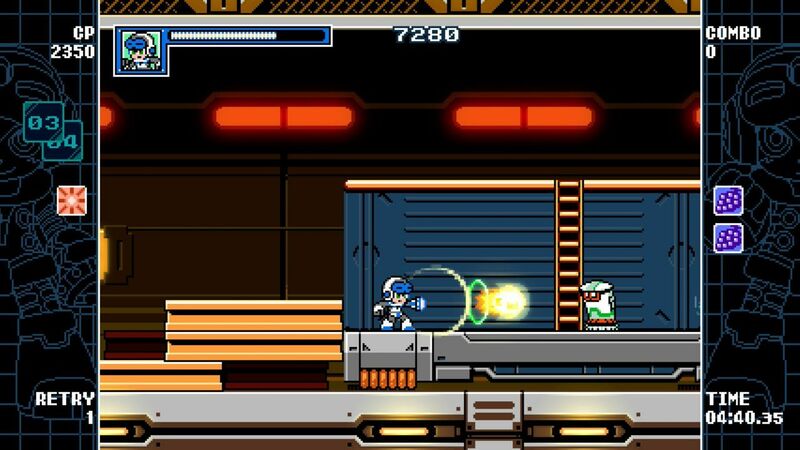 HD Rumble: will Mighty Gunvolt Burst use HD Rumble on the Nintendo Switch? You bet it will! Throughout the game, will often find places that look perfectly normal… until you shoot them and discover they can be destroyed! 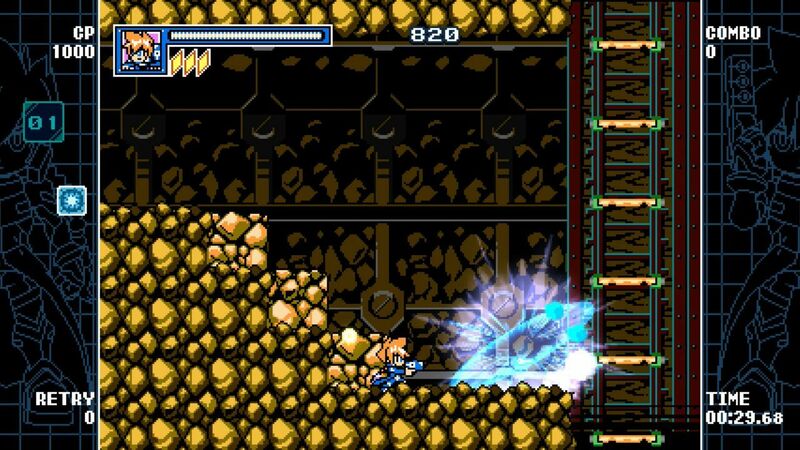 The game has a Dowsing ability (that uses Cost Points), that makes the controller rumble when you’re drawing close to a suspicious area. Pretty handy! Beck is a robot created by Dr. White who has the ability to think and feel. 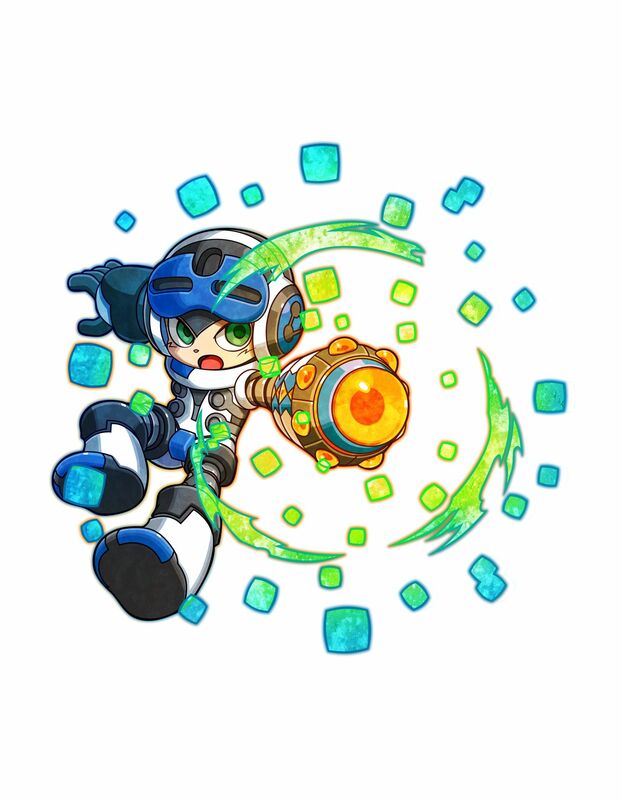 His ability to absorb Xel from robots and learn their abilities has been disabled during his virtual reality training session, so he no longer has access to those abilities while stuck in this virtual world. His only weapon is a new armament entrusted to him by Dr. White. 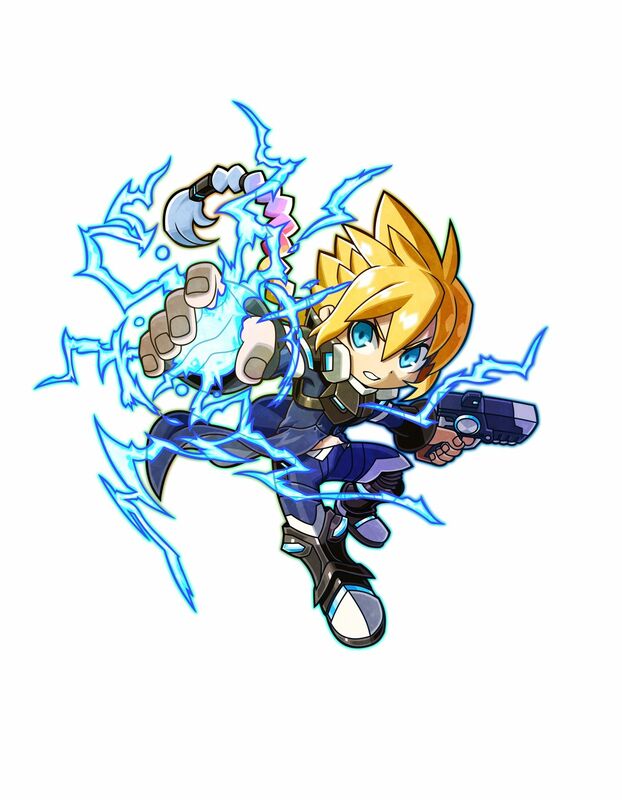 Gunvolt is an Adept, a person who possesses supernatural septimal powers, who can control lightning. The soul of a girl named Joule, AKA “The Muse”, resides within him. 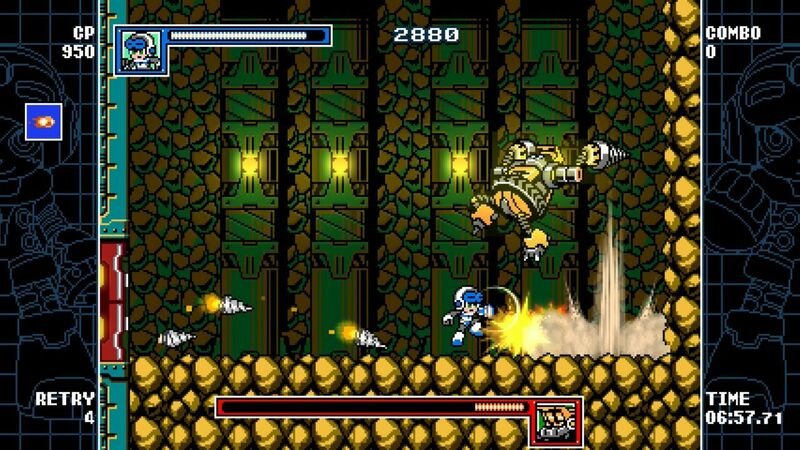 Ever since he was brought to this strange new virtual world, his septimal powers have been severely weakened, although his gun and his Astrasphere skill seem to be in order. 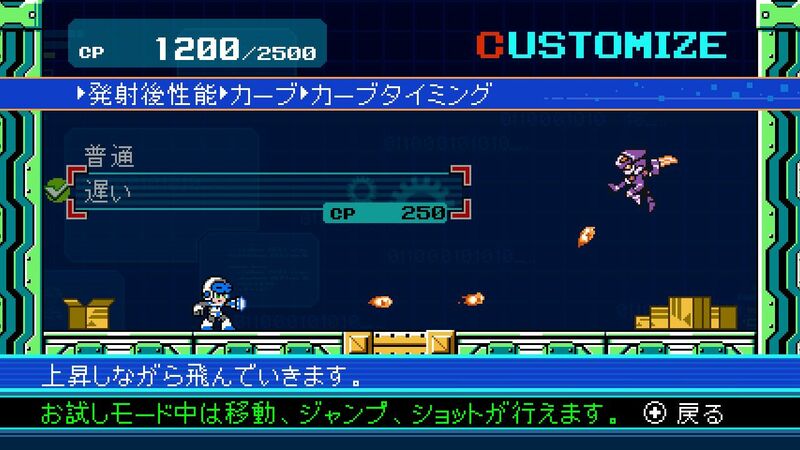 When Gunvolt is in grave danger, Joule will appear to bestow her protective powers on him. More playable characters will be revealed at a later date. 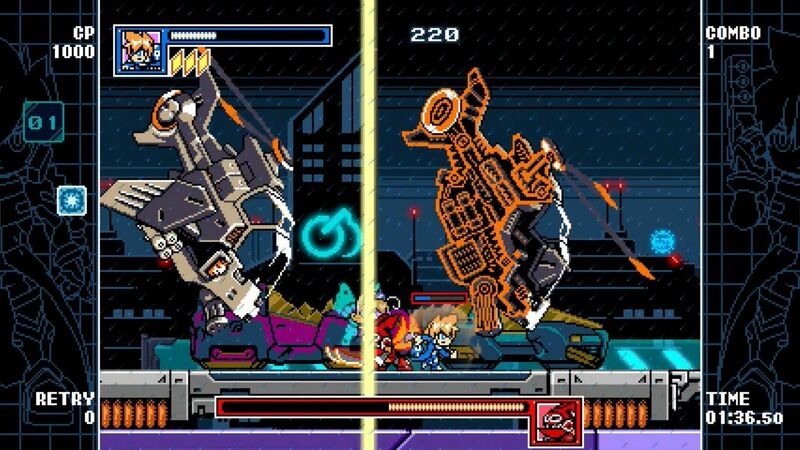 If you’re wondering how Mighty Gunvolt Burst came to be, it’s pretty simple: the team really enjoyed creating the original, and once they were done with Mighty No. 9, they began to miss working with those characters. They went and asked comcept for permission to use the Mighty No. 9 characters, and not only they got permission, they didn’t get to pay anything either. 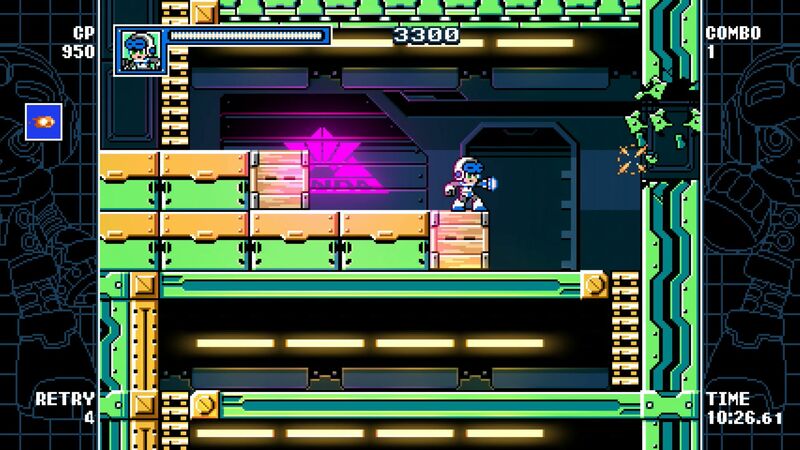 Mighty Gunvolt Burst (Switch, 3DS – eShop) will be released on June 15th on the Nintendo Switch (worldwide), and on June 28th / June 29th on Nintendo 3DS (Japan / Europe and North America). It will cost $9.99 / 9.99€ / 980 Yen / £8.99. 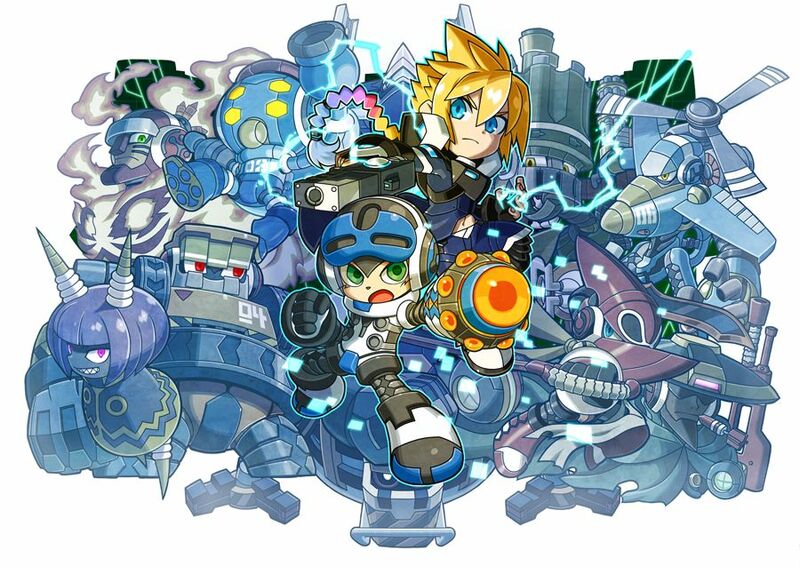 The game will be playable in English and Japanese at launch, with other languages coming at a later date via an update. The Upcoming releases page has been updated!